An opening to spiritual awareness and healing. ...an opening to spiritual awareness and healing. Offices in Winnipeg and Lorette, MB. As part of my licensing agreement as a Spiritual Health Coach, a signed consent form is required with every reading and can be located on the last tab on this website. I support my intuitive skills with Angel Card, Runes and Tarot readings. Readings are done by email and are first come, first serve. I ask that you to email me a picture of yourself (selfies are great) through which I connect to your energy. I then write out your reading and send it to you by email. You can enjoy the reading and have a copy to keep from the privacy of your own home with the same quality of a private reading, but without the fuss of travel time. I am not currently offering Mediumship readings - please check in for any updates. …is a connection to a deceased loved one. Mediums use their psychic or intuitive abilities to connect with the spirit energy of that person who has crossed over, bringing comfort and letting you know that our loved ones are still with us. I currently offer bilingual Mediumship readings via email. Distance is not relevant to readings because Spirit is energy to which we are all connected. You can enjoy the reading from the privacy of your own home with the same quality of a private reading, but without the travel time. These readings will eliminate any concerns of the reader fishing for answers. Please email a clear photograph (please limit to 1 or 2 photos), preferably with a single person in the photo. Although I have had many successful sessions, there are unknown reasons why a spirit may not be able to communicate through me. I have had other insistent spirits come through instead of the one I am trying to connect with. Some of these situations are not fully in my control. *Important note: Do NOT send any personal information. The first name and your relation to your loved one is sufficient. Readings are first come first serve. A signed consent form will be required. I recommend waiting 6 months after a loved one's crossing before getting a reading. Are you ready to soak your fatigued and aching body in a soothing bath with Himalayan bath salts or feel the soothing effects of a Himalayan salt lamp? 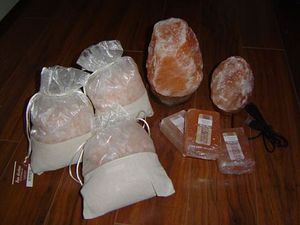 The following Himalayan salt products are available for purchase. I have personally created hand etched glassware with a variety of animal spirit guides. Stay posted for availability and details. "Hi there, thank you so much. This was right on the nose so much I had to hold back tears. Thank you thank you thank you." "Marie-Anne has an uncanny ability to ‘see’ the bigger picture through the cards, and identify details that appear irrelevant until the event materializes. I found when Marie-Anne was somewhat ‘joking’ about an event, her ‘joking’ comment was closer to the truth than I could have realized at the time. In addition to card readings, Marie-Anne also did some mediumship for me regarding my dad’s passing. She gave me details which put my mind at ease. If you have some unsettled events from your past with loved ones, I highly recommend contacting Marie-Anne." Copyright © 2014. Marie-Anne Bisson. All rights reserved.